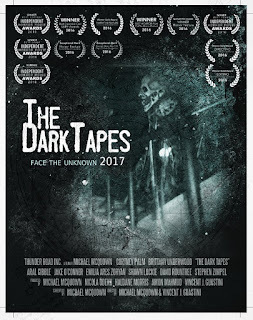 Documenting the contents of “found” tapes from an eight year period involving seemingly unrelated characters, this impressive indie offers a neat riff on the increasingly familiar, post-V/H/S found-footage anthology movie, while cleverly incorporating “relic” technology into its narrative. “To Catch A Demon” follows a group of scientists intent on doing just that, while “The Hunters and the Hunted” is a satisfying twist on POLTERGEIST / INSIDIOUS territory as a young couple calls in the “experts” after experiencing alarming paranormal phenomenon, seemingly linked to their own deceased daughter. “Cam Girls” offers a creepy Skype chat with a pair of attractive bisexual girls, and their grim exploitation of one of their regular viewers spirals into a different genre via a wacky twist few will see coming. “Amanda’s Revenge” presents an abused young woman who seems to develop telekinetic powers after being slipped a roofy at a party. THE DARK TAPES doesn’t always rise above the derivative nature of some of its core stories and ideas, but co-directors Guastini and McQuown sustain an immersive ambience of dread, and have more up their spooky sleeves than most of their peers, displaying a pleasing Lovecraftian influence with their more experimental concepts.